Not to be confused with John Collier (caricaturist). John Maler Collier OBE RP ROI (/ˈkɒliər/; 27 January 1850 – 11 April 1934) was a leading English artist, and an author. He painted in the Pre-Raphaelite style, and was one of the most prominent portrait painters of his generation. Both his marriages were to daughters of Thomas Henry Huxley. He studied painting at the Munich Academy starting in 1875. Collier was from a talented and successful family. His grandfather, John Collier, was a Quaker merchant who became a Member of Parliament. His father, Robert, (who was a Member of Parliament, Attorney General and, for many years, a full-time judge of the Privy Council) was created the first Lord Monkswell. He was also a member of the Royal Society of British Artists. John Collier's elder brother, the second Lord Monkswell, was Under-Secretary of State for War and Chairman of the London County Council. In due course, Collier became an integral part of the family of Thomas Henry Huxley PC, President of the Royal Society from 1883 to 1885. Collier married two of Huxley's daughters and was "on terms of intimate friendship" with his son, the writer Leonard Huxley. Collier's first wife, in 1879, was Marian (Mady) Huxley. She was a painter who studied, like her husband, at the Slade and exhibited at the Royal Academy and elsewhere. After the birth of their only child, a daughter, she suffered severe post-natal depression and was taken to Paris for treatment where, however, she contracted pneumonia and died in 1887. Collier's daughter by his first marriage, Joyce, was a portrait miniaturist, and a member of the Royal Society of Miniature Painters. In 1889 Collier married Mady's younger sister Ethel Huxley. Until the Deceased Wife's Sister's Marriage Act 1907 such a marriage was not possible in England, so the ceremony took place in Norway. By his second wife he had a daughter and a son, Sir Laurence Collier, who was the British Ambassador to Norway 1941–51. Collier's range of portrait subjects was broad. In 1893, for example, his subjects included Lovelace Stamer, Bishop of Shrewsbury; Sir John Lubbock FRS; A N Hornby (Captain of the Lancashire Eleven); Edward Augustus Inglefield (Admiral and Arctic explorer). His commissioned portrait of the Duke of York (later George V) as Master of Trinity House in 1901, and the Prince of Wales (later Edward VIII) were his major royal portraits. The latter work was hung in Durbar Hall, Jodhpur, Rajputana. Other subjects included two Lord Chancellors (the Earl of Selborne in 1882 and the Earl of Halsbury) in 1897; The Speaker of the House of Commons, William Gully, (1897); senior legal figures the Lord Chief Justice Lord Alverstone (1912) and the Master of the Rolls Sir George Jessel (1881). 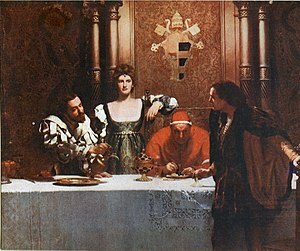 Rudyard Kipling (1891); the painter Sir Lawrence Alma-Tadema (1884); the actors J.L. Toole (1887) and Madge Kendal, Ellen Terry and Herbert Beerbohm Tree (in The Merry Wives of Windsor) (1904); heads of educational institutions such as the Master of Balliol Edward Caird (1904), the Warden of Wadham G.E. Thorley (1889) and the Provost of Eton (1897). Soldiers such as Field Marshal Lord Kitchener of Khartoum (1911) and Field Marshal Sir Frederick Haines (1891); two Indian maharajahs, including the Maharajah of Nepal (1910); and scientists including Charles Darwin (1882), the artist's father-in-law Professor Huxley (1891), William Kingdom Clifford, James Prescott Joule and Sir Michael Foster (1907). Clark reports a total of thirty-two Huxley family portraits during the half-century after his first marriage. A photocopy of John Collier's Sitters Book (made in 1962 from the original in the possession of the artist's son) can be consulted in the Heinz Archive and Library, National Portrait Gallery. This is the artist's own handwritten record of all his portraits, including name of subject, date, fee charged, and details of any major exhibitions of the picture in question. Collier died in 1934. His entry in the Dictionary of National Biography (volume for 1931–40, published 1949) compares his work to that of Frank Holl because of its solemnity. This is only true, however, of his many portraits of distinguished old men — his portraits of younger men, women and children, and his so-called "problem pictures", covering scenes of ordinary life, are often very bright and fresh. His entry in the Dictionary of Art (1996 vol 7, p569), by Geoffrey Ashton, refers to the invisibility of his brush strokes as a "rather unexciting and flat use of paint" but contrasts that with "Collier's strong and surprising sense of colour" which "created a disconcerting verisimilitude in both mood and appearance". The Dictionary of Portrait Painters in Britain up to 1920 (1997) describes his portraits as "painterly works with a fresh use of light and colour". Sixteen of John Collier's paintings are now in the collections of the National Portrait Gallery in London, and two are in the Tate Gallery. Four of the National Portrait Gallery paintings were in December 1997 on display: John Burns, Sir William Huggins, Thomas Huxley (the artist's father in law) and Charles Darwin (copies of the last two are also prominently displayed at the top of the staircase at the Athenaeum Club in London). A 1907 self-portrait has been preserved in the Uffizi in Florence which presumably commissioned it as part of its celebrated collection of artists’ self-portraits. 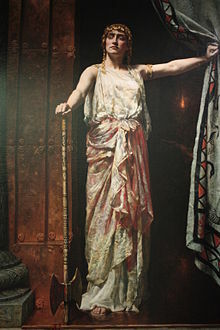 Other pictures may be seen in houses and institutions open to the public: a large and striking painting of the murderess Clytemnestra is in the Guildhall Gallery of the City of London. The Death Sentence was given by the widow of the artist to Wolverhampton Art Gallery. His portrait of the Earl of Onslow (1903), is at Clandon Park, Surrey (National Trust). His full-length portrait of Sir Charles Tertius Mander, first baronet, is at Owlpen Manor, Gloucestershire, with another version in the collection of the National Trust at Wightwick Manor, and his Lady Godiva is in the Herbert Art Gallery and Museum. Reproductions of many others, from various collections, may be consulted in the John Collier box in the National Portrait Gallery Heinz Archive and Library, and a good selection is published in The Art of the Honourable John Collier by W.H. Pollock (1914). His work was also included in the Great Victorian Pictures exhibition mounted by the Arts Council in 1978 (catalogue, p27). 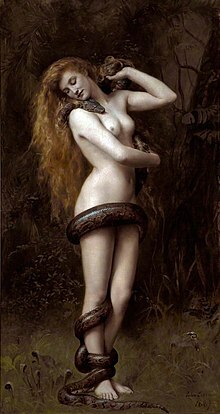 Lilith, 1887, now held at the Atkinson Art Gallery in Southport, Merseyside. Collier's views on religion and ethics are interesting for their comparison with the views of Thomas and Julian Huxley, both of whom gave Romanes lectures on that subject. In The religion of an artist (1926) Collier explains "It [the book] is mostly concerned with ethics apart from religion... I am looking forward to a time when ethics will have taken the place of religion... My religion is really negative. [The benefits of religion] can be attained by other means which are less conducive to strife and which put less strain on upon the reasoning faculties." On secular morality: "My standard is frankly utilitarian. As far as morality is intuitive, I think it may be reduced to an inherent impulse of kindliness towards our fellow citizens." His views on ethics, then, were very close to the agnosticism of T.H. Huxley and the humanism of Julian Huxley. On the idea of God: "People may claim without much exaggeration that the belief in God is universal. They omit to add that superstition, often of the most degraded kind, is just as universal." And "An omnipotent Deity who sentences even the vilest of his creatures to eternal torture is infinitely more cruel than the cruellest man." And on the Church: "To me, as to most Englishmen, the triumph of Roman Catholicism would mean an unspeakable disaster to the cause of civilization." And on non-conformists: "They have a superstitious belief in the actual words of the Bible which is very dangerous". List of Pre-Raphaelite paintings - including the work of John Collier. ^ "Collier, Hon. John". Who's Who. Vol. 59. 1907. p. 362. ^ Here and elsewhere, the source is Collier's notebook, in the archives of the National Portrait Gallery, London. ^ Quotations from Collier, J. 1926. The religion of an artist. Watts, London. Wikimedia Commons has media related to John Collier. This page was last edited on 16 March 2019, at 13:27 (UTC).